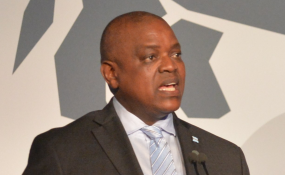 Botswana Democratic Party President Mokgweetsi Masisi (file photo). Serowe — President Dr Mokgweetsi Masisi says Botswana Democratic Party (BDP) will 'flatten' opposition parties in this year's general elections. Speaking at a dinner organised for BDP Central District councillors, President Masisi premised his victory statement on grounds that he had extracted impediments that previously worked against party efforts. He revealed that opposition parties would no longer enjoy mileage from trade unions, which provided them with ammunition to attack BDP. In addition, the President revealed that he had created a smooth working relationship with the private media, which was previously unfriendly to his party. Furthermore, President Masisi informed councillors that he had allayed the then groundswell of fear and complaints over Directorate of Intelligence and Security Services, which was deemed a monster. Dr Masisi said having brought down such walls, a united BDP was on an easy course to victory. In fact, the President said his party was working on a first of its kind manifesto. The BDP leader, who attended the dinner as part of his campaign trail towards the party's elective congress in Kang, promised that if his party emerged a united force after the congress, he would intensify the recruitment drive. He said his recruits would bear testimony that there was every reason to opposition for a better-organised BDP family. The President also warned against indiscipline within the party. He said he would have a camp that would welcome everyone, provided they were disciplined. In fact, Dr Masisi said he believed there had never been a president as accessible as he was and therefore welcomed all sorts of constructive criticism. He, however, warned members against dividing the party.